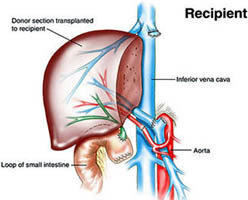 Liver transplantation is a surgical procedure whereby a diseased or failing liver is either removed and replaced by a whole new liver from a deceased donor, or where part of a healthy liver from a living donor is removed and inserted to the failing liver of the recipient to encourage and promote growth of new and healthy liver cells. This 2nd type of transplant is sometimes called a split-liver transplant. The recovery time varies but generally takes around 3 months. Thereafter, most recipients can lead a normal and active life, though most will require drugs for the remainder of their life to prevent the body's immune system from rejecting the new liver. Liver Transplant is offered at Liver Transplant Hospitals in India with large cost difference and virtually no waiting times compared to the US and Canada. The cost of liver transplant in at hospital in India is less than $60,000. 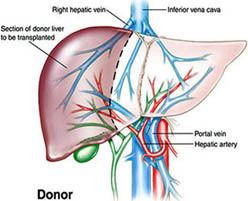 We Care India arrange liver transplant in India at Hospital in India at Delhi, Chennai and Bangalore hospital. We can only facilitate live liver transplants. This means that every recipient needs to find a suitable donor willing to donate part of their liver. In India it is illegal to do transplants, including liver transplants, on foreigners unless they bring a donor. We strictly adhere to these regulations and cannot make any exceptions. Currently, more than 17000 people are on the waiting list for a liver transplant in the US. We have been able to get patients from first contact to life saving surgery in India in a matter of 3 weeks. In addition to reducing waiting times, We Care India can also reduce the costs for liver transplant dramatically. Whereas costs in the US / Europe are often in excess of $350,000, costs for liver transplant in India will be less than $60,000. Before you leave your country, we need to get all of the pertinent records of the recipient. We can tell you exactly what those records are. Your records will allow Liver Transplant Surgeon to medically qualify you. Next to the donor qualifying medically, the requirement of having a donor that is closely related to the recipient is the most important requirement. The medical requirements are that the donor is a family member between 18 and 65 years old and that the blood group is suitable. Additional medical requirements will be discussed in person. Both recipient and donor will go through quite extensive testing prior to leaving. We will guide you through the needed tests quickly. In addition to the medical tests, there also are many legalities that need to be fulfilled that are beyond the requirements for other types of surgeries. Again, We will quickly assist you in gathering the correct paperwork. After your arrival in India, you and your donor will go through further testing. You will both also receive special diets to strengthen you for surgery. The surgery is of high risk and you will need your strength. The surgery itself is complex and can take up to 19 hours to perform. Right after surgery both donor and recipient will be in separate ICU’s. The recipient will spend many days there. The donor is usually moved to a regular hospital room much quicker. The recovery in India can be 1-2 months, depending on the specific circumstances. We Care India will make all the arrangements for you .